Please join us for a luncheon to celebrate the impact of philanthropy in our region. To RSVP contact us at 270-737-8393 or contact@ckcf4people.org. 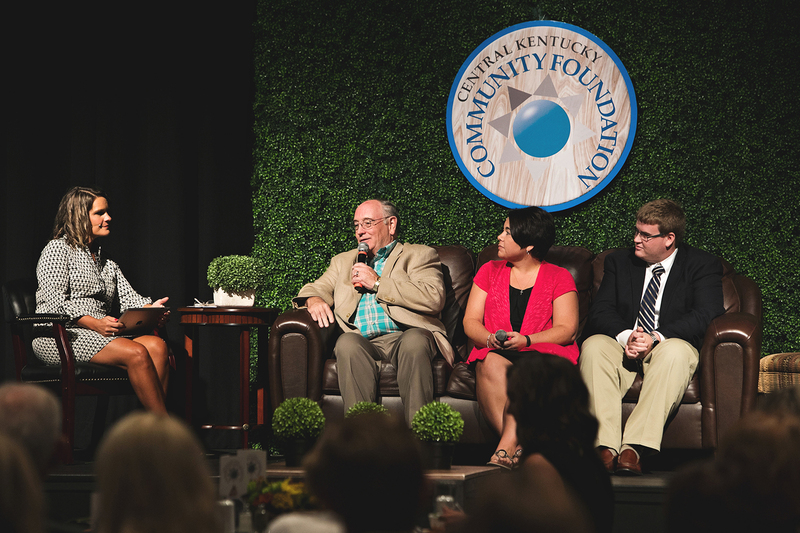 On Thursday, September 21, 2017, community leaders and champions joined with Central Kentucky Community Foundation to celebrate the impact philanthropy plays in our communities. Our fifth Celebrating Community Philanthropy event was a wonderful opportunity for us to pause, come together and focus on the generosity of ideas and resources our community has for others. This year’s theme, Philanthropy Gives Life, speaks to the many community initiatives philanthropy brings to bear. Philanthropy Gives Life is about establishing those ideas that create, strengthen and inspire opportunities for the betterment of others. Angie Cann, set off a snowball effect in our community after her sister, Jamie Owen was diagnosed with cancer. Hundreds in our community took to social media to spread kindness in honor of Jamie. Angie’s goal was to make her sister smile when she logged onto social media the day of her first chemo treatment. Angie and Jamie were both overwhelmed by the response. People supported the animal shelter, educators and did random acts of kindness on each day Jamie had chemo, often wearing #JoinJamiesJourney shirts. It’s a perfect example of this year’s theme; Philanthropy Gives Life. Scholarships are extremely important to our local students and a significant piece of CKCF’s work. 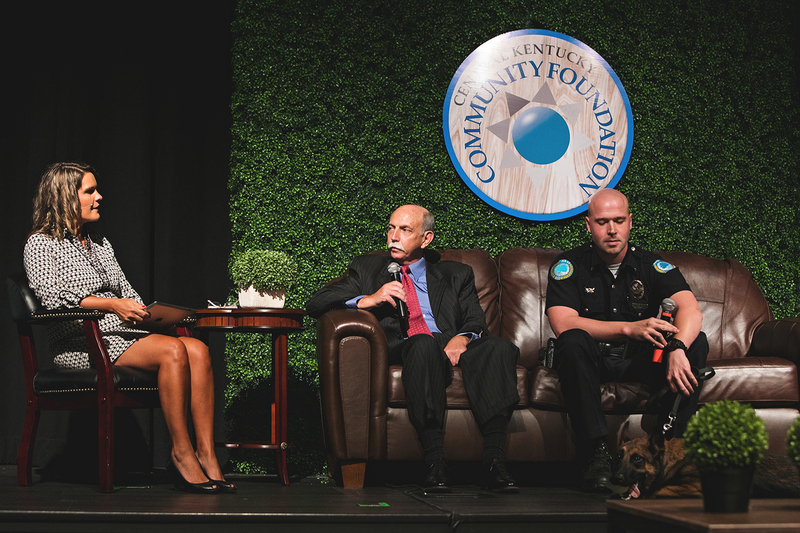 Bob Swope, Melissa Butler and Matthew Moreman shared why they feel this is an essential initiative to our community. When the Elizabethtown Class of `66 came together for their 30th reunion they decided to give back to future graduates of Elizabethtown High School and they decided the best way to do that was through a scholarship fund. Matthew Moreman couldn’t agree more. CKCF offered 95 scholarships and awarded over $115,000 to students in our region for academic or technical study. The online portal, Scholarship Central is essential for helping students navigate the complicated scholarship process. In 2014, a new organization, the Elizabethtown Police Foundation, was getting started. Retired Police Chief Tracy Schiller said CKCF played an essential role getting EPF off the ground. Officer Chris Smith spoke about how much support from EPF means to officers. EPF provides much needed resources, like their drug dog Canine Lola (who also joined us at the luncheon), and assists officers, staff and their families in times of crisis. Three years ago, 44 women came together to create Heels Together, an initiative to support women and girls. When asked why investing in women and girls is important to her, Heels Together investor Christy Pritchard said, “When 51% of your population is not given the tools to feel empowered to succeed, the whole community suffers. THAT should matter to everyone.” Jerisia Lamons, speaking about Heels Together grant program Heels Academy, shared how the funding is shaping women’s lives by providing them the skills and knowledge they need to become self-sufficient. 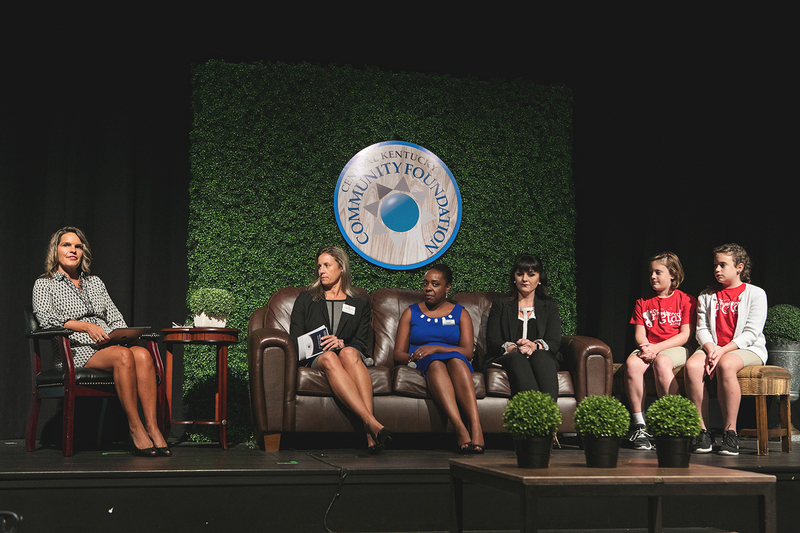 Another Heels Together grant program, Shattered Glass, exposes and empowers the young women in STEM related fields. Harper and Klaire Warrell attended the 2017 Shattered Glass Summit where they learned to program robots and fly drones. They were able to see and explore the many career opportunities in these fields.